There are so many amazing romantic travel experiences to have in this world. From watching a gorgeous sunset on the beach to admiring an epic view from a hot air balloon. 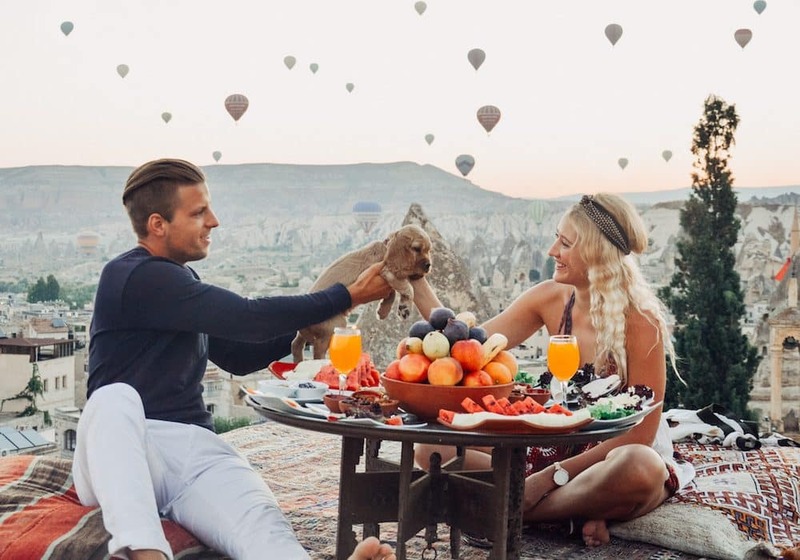 We asked 10 different travel couples what their most romantic travel experiences is so far. Read on for the 10 most romantic travel experiences according to 10 different travel couples. 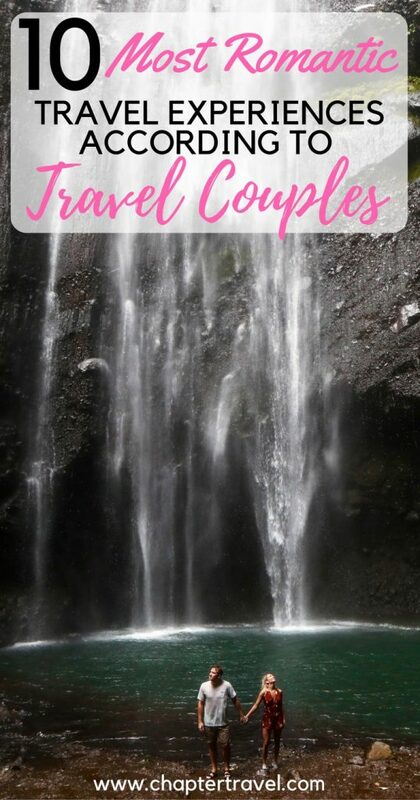 Be sure to also read our other travel couples inspired articles: 16 Travel Couples Share the Best Part about Travelling Together and 10 Couples who travel the world share their best advice. What is your most romantic travel experience? 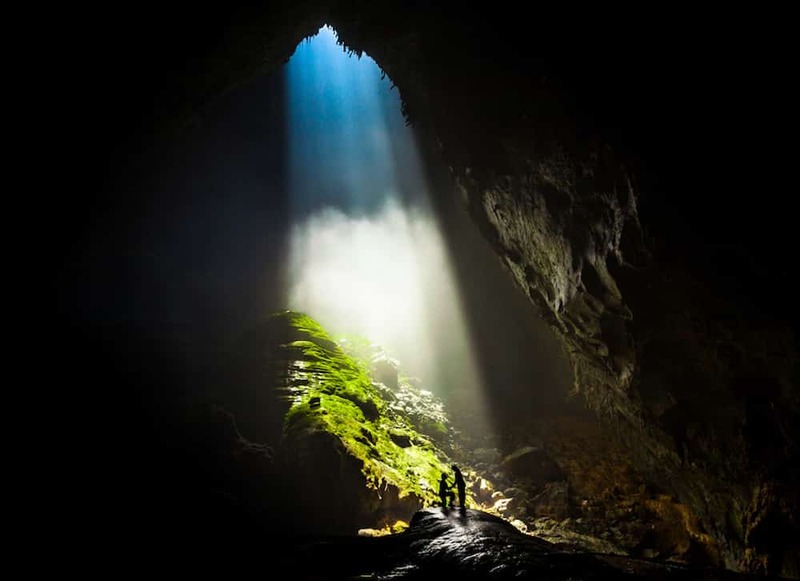 For us our most romantic travel experience was the time we explored Hang Son Doong, the world’s largest cave, in Vietnam. We spent 5 days trekking through the jungle, spelunking inside the caverns and even camping in the enormous chambers. The adventure was amazing, but what made it really special was it was the place that we got engaged as well. About Alesha and Jarryd: Alesha and Jarryd are the nomadic writers, photographers and explorers behind Australia’s top adventure travel blog, NOMADasaurus. They’ve been wandering the world together since 2008, searching for adventure and culture in off the beaten path destinations. 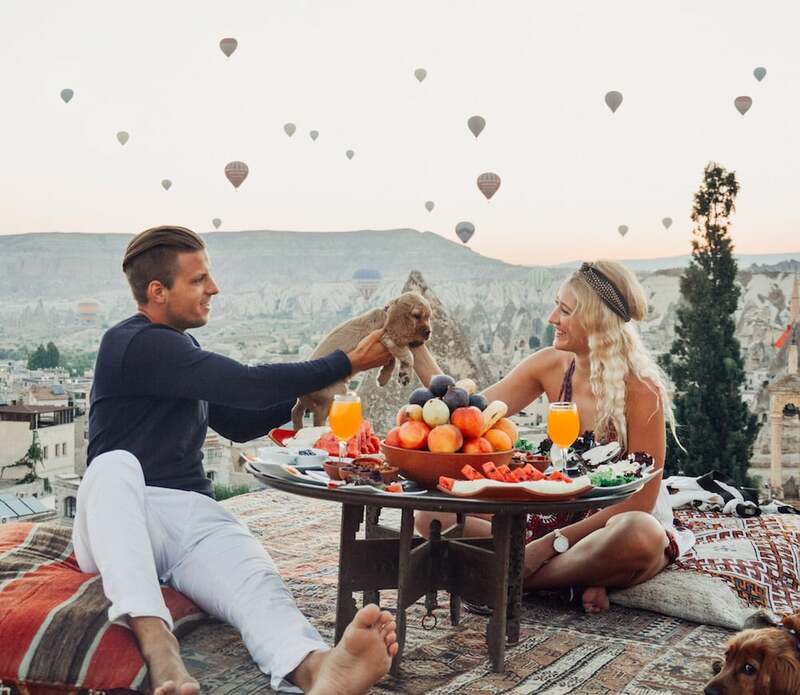 One of the most romantic places we have ever been to was Cappadocia, Turkey. A place where hotels are hundreds and hundreds of years old caves, where dozens of balloons fill up the sky in early mornings and where the whole town looks like outta fairytale. It blew us away!! About Uroš and Lara : We are Lara and Uroš, we are travel bloggers, social media strategists, photographers and journalists by profession. We are now permanently traveling the world. Our sole intention is finding places that are very aspirational and photogenic and for our followers to enjoy our content. Camping in Namibia has to be one of our favourite (and most romantic) experience. You wake up on top of your studly 4×4 (which you drove across the desert to one of the few campgrounds available to you in this southern African country), unzip your tent, and overlook the sunrise. A truly magical way to spend a morning with your favourite person. About Chanel & Stevo: We met in Spring 2010 on a blind date, and since then, our life has revolved around adventure so much so that we decided to give up the “normal” life. We travel around the world, hoping to see ‘how far from home’ we could go, and how far out of the comfort zone we could push ourselves. Creatively enlightened, and on a constant quest to tell better stories, we’re still traveling, now 2.5 years and 43 countries later, documenting our travels on Instagram, YouTube, and our blog. Exploring Krabi, Thailand was truly one of the most romantic experiences. 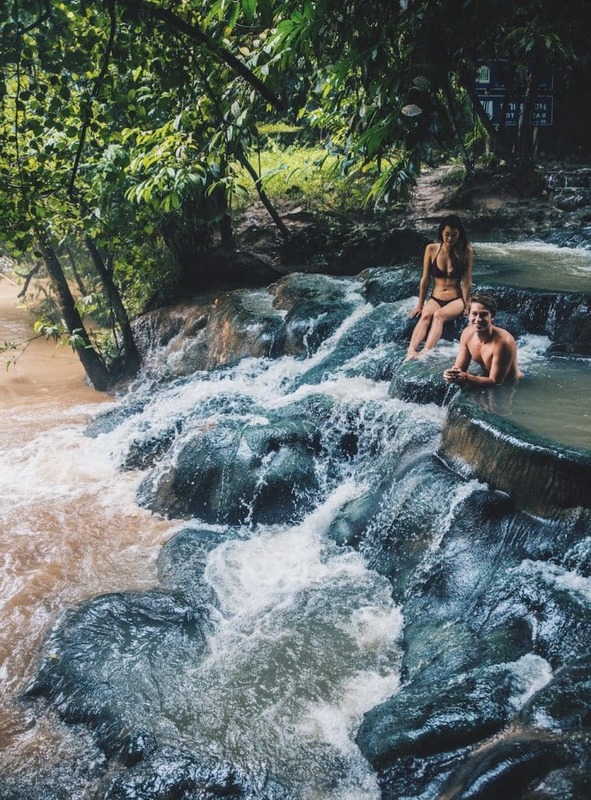 From long sunsets on the most beautiful beaches, sharing private hot springs, and of course the incredible food. It truly was a paradise. Being surrounded by serene natural beauty at all times really made it a once in a lifetime experience. About Louise and Robin: Louise and Robin are outdoor-loving, adventure junkies who have been traveling the world together for 6 years. They are the creators of Elite Jetsetter, an adventure travel blog based in the Rocky Mountains. Their goal is to inspire others to get outside and explore the planet through their photography. One of our most epic and recent romantic travel experiences would have to be our 45-day safari through Kenya, Zambia, Zimbabwe, and Tanzania! Which all started with our spontaneous trip to South Africa, where we fell in love with Africa so much we decided to buy a car and drive it around 14 African nations. We were invited to a few epic safaris. It’s hard for me to pin down an exact moment that was the most romantic, because being together to witness a zebra give birth, elephants eating next to our tent, and hyenas call out at night is all pretty spectacular. We even got to wake before the sun rose one morning to take a hot air balloon ride over the Masai Mara! 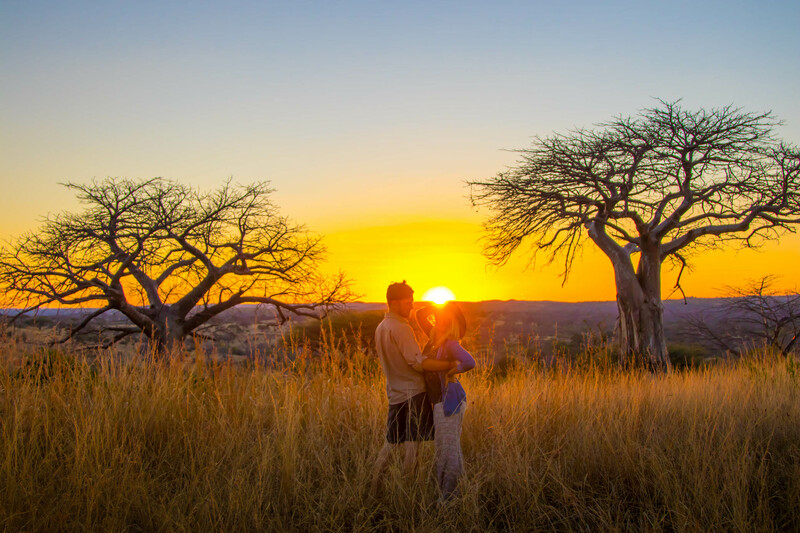 Africa and safaris are always romanticised in the movies, but we can certainly say that they are just as romantic in real life! 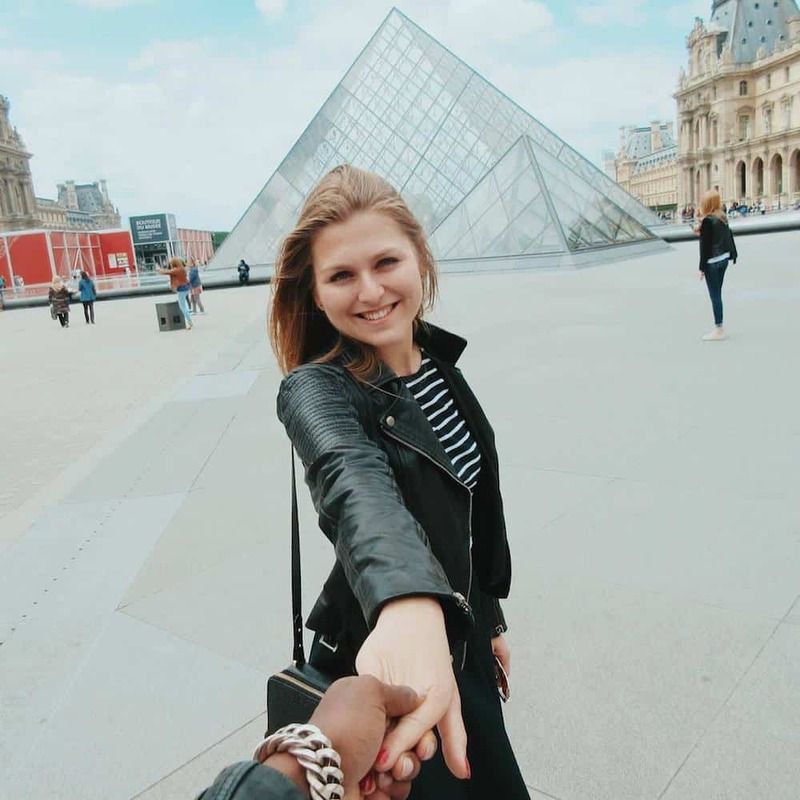 About Natasha and Cameron: Natasha and Cameron met at the end of their college career and after only a few dates decided they should travel to Europe together. Now, more than four years later they have ventured to over 60 countries together! Our favourite romantic travel experience was definitely our trip together to Paris! Not just because Paris is the city of love. But most definitely because it was our first trip together. The best part, it was a surprise birthday present from Roos. She surprised me at work and kidnapped me to Paris. About Roos and Guleed: For us Thisworldstillrocks is not just about travelling. It’s so much more. Our relationship was destined to fail. We had different background, values, religions and culture. But our love for each other has overcome all our differences. Despite all the bad things in the world, there is so much beauty in this world and we want to capture it and share it with the world. We definitely have to choose our trip to Thailand and Malaysia back in 2015 as the most romantic travel experience, since that was the trip when I asked Maggs to marry me. This special moment happened in an idyllic beach of Koh Lipe with the sun shining. It was truly perfect and a day we will never forget. I picked Thailand as the perfect destination for the big proposal because it really is a special country for us as a couple. In fact Thailand was the first country in Asia we explored together and one of the places we visited years later during our big trip. About Dan and Maggs: We are a couple from Portugal whose biggest passion is to travel the world in search of beautiful places and to get the chance to meet unique people. Dan is the easy-going social guy who starts a conversation with everyone to know their stories and share experiences, while Maggs is the warm-hearted girl who loves photography and wishes to show the beauty in this planet through her photographs. We’ve been extremely lucky to get to experience so many romantic moments traveling the world as a couple, so it’s really tough to chose one. We can both agree our most romantic times have been in which we’ve made a point to put down our cameras and be fully present in a moment together. 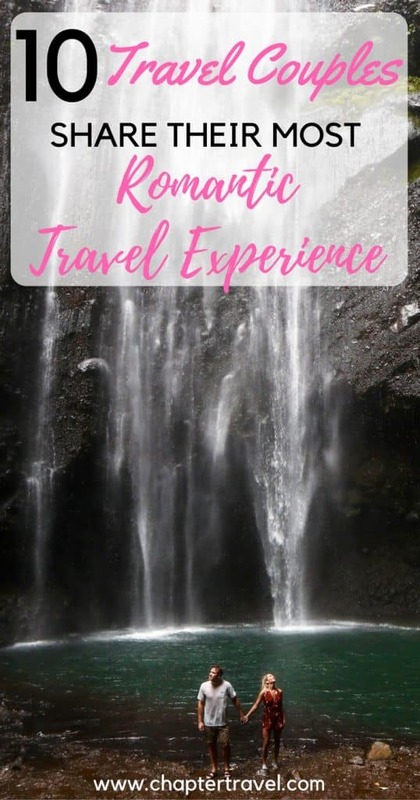 The one experience we both thought about first was a waterfall we traveled to in East Java. It was absolutely gorgeous, and we had the place to ourselves for two hours! 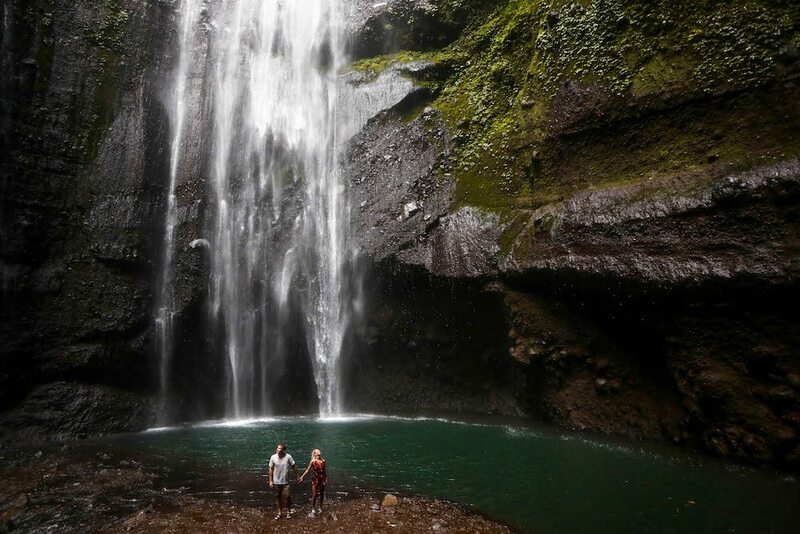 It will be hard for us to beat swimming in those huge falls together, but we’ll keep trying anyways. About Steph and Jace: We are an American couple traveling the world. Both of us grew up in the Midwest and met while living in California. We took our first international trip together in July 2016 and bonded over a shared passion for travel, adventure and exploring different cultures. In February of 2017 we decided to quit our jobs in California, sell everything we own, and take off to travel the world! Our most romantic travel experience was probably on our 10th anniversary in Corfu, Greece. As full-time travellers, it kind of feels like every day is a honeymoon, so it’s hard to come up with something truly unique to celebrate special occasions. But we figured it out! We rented our own boat for a full day and drove around to different beaches and hidden coves on the island. Some of them even had small little restaurants and tavernas that were only accessible by boat. We popped some champaign, sun tanned and listened to music under the Mediterranean sun. It was incredible. About Nick and Dariece: Goats On The Road is a website that teaches people how to start a travel blog and other online money making methods to help earn money for travel. Our most romantic experience was in Santorini at the Erossea Villa Santorini. They had the most amazing views of Oia to wake up to. About Xavier and Katie: Xavier and I are originally based in the US and now currently traveling full time. We had a long distance relationship for years between the US and Switzerland (where Xavier is from) then decided to get married and settle in Arizona. So instead of buying a new house, we saved all our money to travel the world. Those were the 10 romantic travel experiences by 10 different travel couples. Are you also craving another trip right now? We are! Inspire us and let us know what your most romantic travel experience is in the comments! Loved this post! So many amazing adventures added to my bucket list! So many exotic travels! But I guess Namibia was the one that really caught my eye! P.S. those couples pictures are amazing! We mostly do just a few with a tripod when we travel, but some of these seriously just got copied to the folder “inspiration for couples pictures”! These beautiful photos have captured the different essence of romance in the life of love and adventure! Wow wow wow, just blown away by all of these AH-maazing experiences – feeling so inspired! There’s my romantic travel bucket list sorted right there :O Now the difficult decision in choosing where to go first!